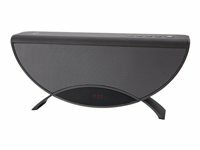 The APOLLYON is a Bluetooth multimedia speaker which connects to any Bluetooth phone, tablet, or laptop. An elegant, artistic design projects pure style, while high quality stereo sound makes the APOLLYON a great lifestyle accessory. batteries may not be disposed of as ordinary household waste. As the end user, you are obliged to return used batteries. You can return batteries free of charge after use to the retail outlet, municipal collection points or shops. You can also return batteries to the seller by post. Rechargeable or disposable batteries that contain hazardous substances are labeled accordingly by a crossed-out wheelie bin. The chemical symbol for the hazardous substance is indicated beside the wheelie bin symbol. Cd stands for cadmium, Pb for lead and Hg for mercury.